Look no further. We will organise your Bazbus and Kruger Park Safari's. Clean, safe and brand spanking new, be the first to tell your fellow traveller's we are number one in service!! ELECTRIC BLANKETS on ALL our beds to keep away the winter chill...!! 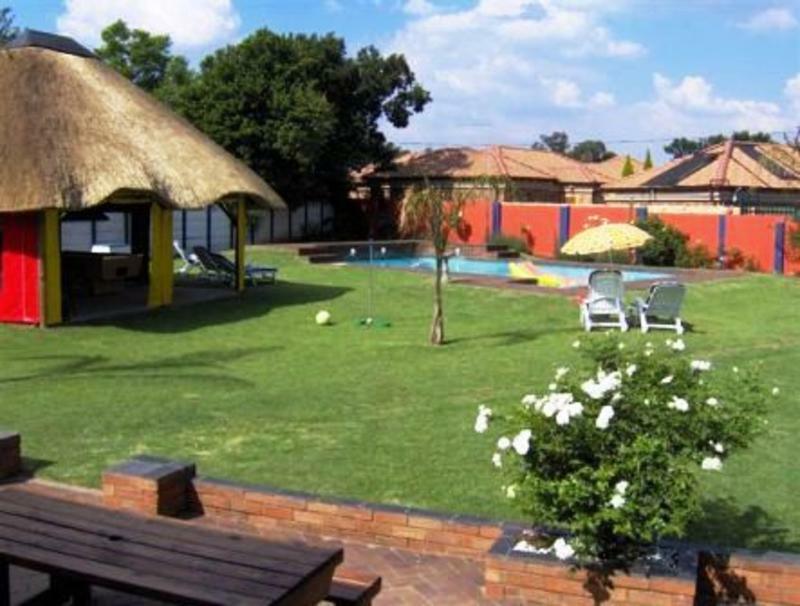 Situated only 15 minutes away from Johannesburg's OR Tambo Airport, Mbizi Backpackers Lodge offers relaxing 'home-away-from-home' accommodation for all travelers. 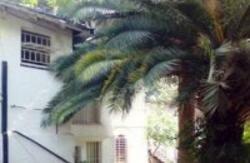 Spacious and vibrantly decorated rooms are serviced daily. There is a self-catering kitchen and an outside entertainment area where you can enjoy a game of pool or simply chill while listening to music. Relax and unwind around a cool, sparkling swimming pool set in magnificent gardens or share your traveling experiences with kindred folk around an outdoor fire whilst barbequing meat 'the African way'. Whatever you choose to do, we promise to make your stay a memorable one - a colorful, happy snapshot of your visit to Africa. 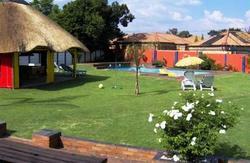 We offer CHEAP (from R60 p/p) airport (Jhb's OR Tambo) and train/bus station (Johannesburg) pick-ups. If you have rented a car at the airport, take the R21 (BOKSBURG). Exit the highway and continue straight until you reach the T-junction (+/-9.5km from leaving the airport). Turn left and at the first set of traffic lights turn right. Travel 2.8km, and we are on the left-hand side of the road with a bright orange and blue wall. From the Kruger National Park, Mozambique and Nelspruit take the Atlas Road exit from the N12 highway. Turn right into North Rand Road (It is at the 2nd set of traffic lights) and continue on until you reach Trichardt Road (CTM will be on your left). Turn left and continue down through Boksburg CBD. You will find us +/- 1000m on the left-hand side after the KFC. Travelling up from Cape Town, you need to get on the N12 (WITBANK) highway on the outskirts of Johannesburg and then get on to the N17 Toll Road (ZAR3 Toll fee). Take the Rondebult/Mapleton off-ramp. Turn left at the robots at the top of the off-ramp and then right at the first set of robots. Travel along this road until the next set of robots where you turn left. Go down the road, past the 'Bokkie Park'. We are +/-400m from the 'Bokkie Park' on the right hand side of the road. From the Drakensberg, Durban or Transkei, take the Benoni/Heidelberg off-ramp off the N3. Turn right and carry on until you come to the Carnival City Casino. Turn left and carry on until you see the Trichardt Road sign and turn right. Go down the road, past the 'Bokkie Park'. We are +/-400m from the 'Bokkie Park' on the right hand side of the road. Bright orange and blue wall.